https://www.kipling-usa.com/seoul-go-large-15%22-laptop-backpack/100266709.html Seoul Go Large 15" Laptop Backpack This best-selling laptop backpack now officially has it all thanks to our newest feature: water bottle pockets. Our Seoul backpack is equipped with padded shoulder straps, a durable exterior, and roomy interior. Seoul easily fits textbooks and essentials, plus it has a protective sleeve for your 15" laptop, too! Zip-front pocket contains; two pen sleeves, cell phone pocket, slip pocket and large zip pocket so you can keep your essentials organized on-the-go. Awesome book bag for school! As a commuter student, I appreciate the size and amount of pockets it has. The material is perfect and really great quality, the zippers don't get caught or stuck. The color is only slightly lighter than in the picture but it's not a significant difference. This is the perfect backpack for any high school or college student. I have previously bought from Kipling and have used the same backpack for 4 years without any problems. I love the Seoul Go mostly for its water bottle pockets and love the different pockets which perfectly fit my laptop, phone, and calculator. I ordered can’t print product order time but this time I am very disappointed it for they same the WRONG color, I got PINK color not the one shows on photo. Hi Edith, We are sorry to hear that you had some issues with the color received. Customer service will be reaching out to you via email with a resolution. Hi Rose, thank you for calling this out for us. We are working to get this color correct. Impressed by the shipping speed. I used to had already one of this backpacks. Older model but pretty much the same. I felt this one a little lighter. Maybe not as tought as last one. I love Kipling due to their durability and style. I currently have a Seoul and wanted a backpack with the water bottle pouches so ordered this one. I already know that it will be of great quality and that it will have all the pockets inside that I need. i bought it before and wanted it in a different color. because the color desert rose is not that they show in the photo and the one they send is different? BEST ANSWER: Hi Crisstina, We are sorry for any issues with the color you received for the Seoul Go Large 15" Laptop Backpack. Someone from customer service will reach out to you via email to get more information. Hey Cristy, so I thought that the color seemed different (based on the picture in the email) and I'm not sure if it's just me but I believe that the website shows the color that I received now. 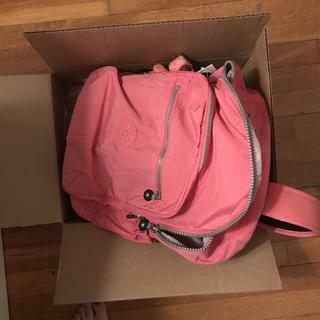 So this backpack is great and it was my fault for somehow thinking that this backpack would be more on the red/brown side rather than pink. I can say that can be true. Because I bought a different bag and it was supposed to be pink turned out to be orange. Its pretty much the same color. Maybe a little bit more dusty or soft pink. The color in real life seems more pink.